All of our services are designed to help people be more productive with the software they use to run their business. 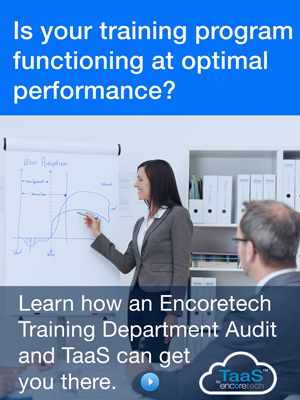 FLEXIBLE, SUBSCRIPTION-BASED OUTSOURCED TRAINING SPANNING STRATEGY THRU DELIVERY. Nothing can derail a project quicker than poor up-front planning. We have years of experience, and can help you set the stage for a successful rollout. Our professional, well-prepared team of trainers and floor support personnel are equally comfortable working on large-scale rollouts or handling new-hire training. Your technology upgrade is a substantial investment and user adoption is critical to success. We know how to create user excitement to ensure your success. 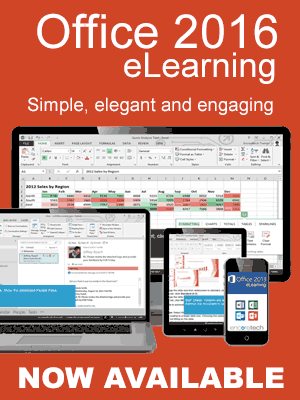 EncoreLMS is a set of apps that work together to streamline training for onboarding new employees, software rollouts, prescriptive training, continuing education, compliance, and professional development. 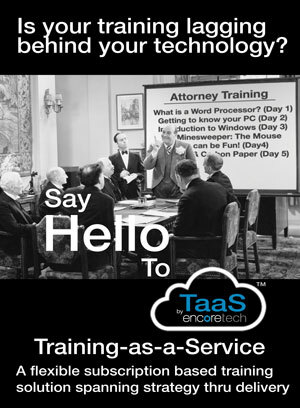 As an LTA partner, Encoretech is ideally positioned to help law firms address technology skill gaps and most importantly, establish ongoing learning solutions and methods that will enable affected attorneys and entire firm user populations to retain higher tech skills moving forward. Planning to migrate to NetDocuments? We have you covered; we’ve done everything from a 1300 user, 55 office, international migration to a 1400 user “Big Bang” flash cut to the corporate legal department.